Yes, it does exist! I have found it! 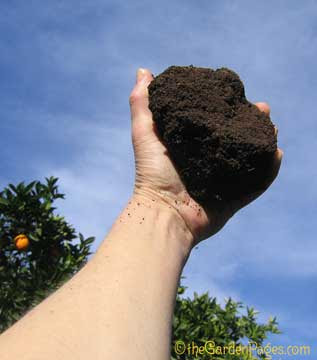 Compost can be made in California and here's a giant chunk of that wonderful black gold in my hot little hand. I don't know why I get so excited about compost. Perhaps the fact that even I can do it? It's free, improves my soil and fertilizes my plants? Or, it's full of worms and just cool? The compost was sticking together but it was crumbly like chocolate cake. That's what gave me the idea of taking a photo on a cake plate. My compost is posing with a beautiful antique dinner fork; International Silver's Countess pattern. What's weird about that? Should I have used a salad fork? Anywhoo, I was thinking of the many discussions I've read around some gardening forums where people claim you cannot make compost in California: "It's too hot." "It's too dry." Or, my favorite: "I lived in California for three years -- I know!" Well that's not the Can Do Spirit that built The West my friend. Here's how I do it. I have a round plastic compost container I got from the City of Los Angeles compost program. It is located in an east facing corner of my yard and it gets shade most of the day thanks to the brush cherry shrubs I planted to hide it. I don't cover my pile with a lid, it likes to roam free. I pile in everything I can find; kitchen scraps, eggshells, cut grass, clippings (except roses) even all my massive wisteria litter. Sometimes the wisteria pods and peanut shells come out looking the same as when they went in, but who's counting? I don't have much of a composting regimen. When there are a lot of fresh clippings in the bin I try to turn it at least once a week. Turning gets air into the mixture so it heats up and cooks faster. I water once a month or so, or if the texture is really dry. I also pour in the water from my flower vases (and the flowers). If your compost pile smells bad something is wrong; usually too much water. Just turn it for a few days in a row, that should balance things out. The key is making sure your pile is sitting on the bare ground. This lets things drain normally and lets the worms in too. Grass clippings cook fast but need to be broken up or they will form a solid mat. Grass can also be smelly when it's fresh so mix well to dry it out faster. If there is a lot of grass sometimes the pile heats up so much there's a (harmless) white residue from the heat. I don't like to have more than say, 50% grass in my bin. If there's too much, I just spread the grass next to the bin until I have room to mix it in. Yes, sometimes I turn that pile too. Nobody says you have to use a bin at all. I turn my compost pile with a good, old fashioned American pitchfork. I probably don't get all the way to the bottom like those super-deluxe compost turners, but that's OK. Attacking your compost pile with a pitchfork is a really, really fantastic way to work off stress and anxiety! But you should stretch and warm up for a minute beforehand so you don't put out your shoulder. I don't add any of those snake oil "starters" to my pile. There's plenty of bacteria in there so it composts just fine thanks. I know that you can supercharge your compost with molasses, but I prefer to bake cookies. After all is said and done, I get around 3 to 4 wheelbarrows full of compost a year. 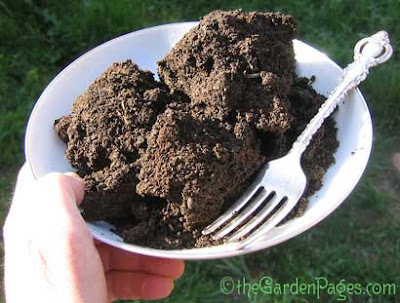 CNN recently covered the home gardening trend and mentioned The National Gardening Association reports home gardening is up 19%; you're gonna want an order of compost on the side with that. Now, to clarify my gold metaphors. I know Black Gold or Texas Tea is crude oil, the kind Jed Clampett likes. But we have golden gold here in California which is where the "Eureka" comes in: Eureka is the state motto of California. It is Greek for "I have found it" and was reportedly shouted by early gold miners. Although frankly if I find a nugget in my yard, that won't be the first expression that escapes my lips. In the meantime I will settle for my compost gold and happy plants.